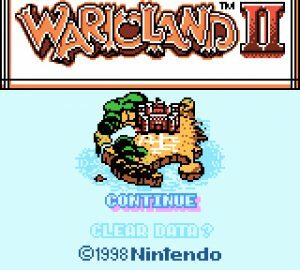 Wario Land II review by Yui-Chan! 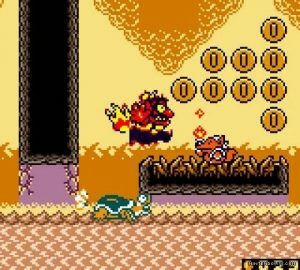 It has been awhile since the last review I did for you, so I am back to bring you another review of the most recent title I played: Wario Land II! Everyone recommended me to play either Wario Land II or Wario Land 3, so expect me to play the latter soon! Again, a big “THANK YOU” for all of you, who have been so kind and caring to me, as well as introducing me to this world of wonderful games! Time to review the third adventure of our greedy treasure hunter friend we all know and love! Wario Land II is a game that came out in 1998 for the Game Boy and has made its way to the Game Boy Color the following year. Japan only got the Game Boy Color version, which came out at the end of 1998, and this was the reason why the game was upgraded for the rest of the world. The game was then released once more worldwide for the Nintendo 3DS Virtual Console, in 2012. The latter is the version which I have played for this review. The game starts off with a really nice introduction, in the clouds, slowly revealing Kitchen Island in the sea, and as the music ends, the glorious title falls down! Simple but effective! As expected, the games revolves around our favorite protagonist and anti-hero Wario. While Wario is taking a good, well deserved nap, Captain Syrup, the antagonist of the previous title, sends her gooms, the Spearmen, called the “Black Sugar Gang”, to steal Wario’s treasures and cause havoc to slow him down! It is time for Wario to wake up and go after them! One of the many pranks and traps that the gang puts up, is the giant alarm clock, which wakes our protagonist up in a grumpy mood. At this point, the game has started, so you have to wake Wario up and start hunting. You will notice how well Wario controls and how simple the controls are too! To play the game, you need to press the A button to jump, the B button to do Wario’s trademark shoulder dash and the directional pad left and right to move. Holding up while jumping makes Wario jump higher, holding down makes Wario crouch down to fit small gaps. Other controls involve pressing up to enter doors, pressing down on a slope for Wario to slide… On second thought, it plays similarly to Wario Land 4! Wario throwing a spearman at some “enemy blocks”. 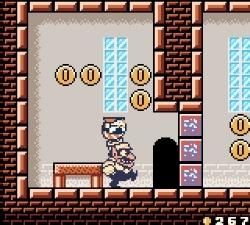 You start off in Wario’s room and right from the start you can already break the walls and floor to find hidden money all over the place! This tells you how the game works, you need to be curious and explore every corner to get as much money as possible! 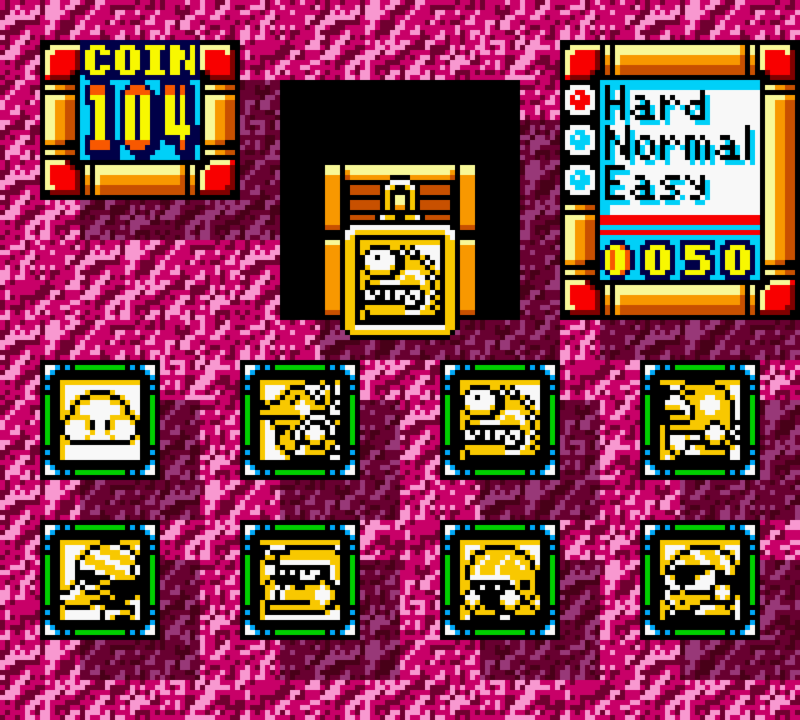 Money is important for two things: To get all the treasures and to get all the panel pieces at the end of each stage. The treasures are won by completing a quick minigame, in which you can spend 200 coins for easy mode, 100 for normal and 50 for hard mode. The harder the difficulty, the less time you have to find the same panel as the one on the lock of the chest. Once you answer correctly, you get your treasure! The treasure room can be found in specific doors of each stage, some of them are hidden in secret spots, so make sure you look around to find them! 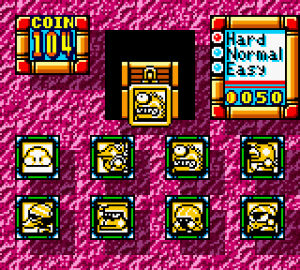 The second minigame is happens at the end of each level, after the coin total is shown. The minigame consists in identifying the correct number from 0 to 9, hidden behind the panels of a 3 by 3 grid. You are allowed to flip a panel at random for 50 coins, revealing part of the number. If you flip enough panels to make a guess, you can press B to select which number you think is hidden there, and if you guess correctly, a piece of a map is given to you. Collect every piece on every stage to unlock something special! Exploration is everything in this game, and in this game, Wario is immortal! Yes, there is no Game Over or restart the stage if you lose a life because there are no lives! Do not worry, this does not make the game easier, as the obstacles can be very tricky and hold you back for long. This also allows Wario to get special forms and effects from some enemies! Wario can be fattened like a pancake, be stung by bees, turned into a zombie and even get his buttocks on fire! All of those transformations can either be useful or an obstacle, and they are used throughout the game in very creative ways. For example, when Wario’s buttocks is on fire, also known as the Fire Wario transformation, he cannot be controlled with the directional pad, as he moves on a constant line until he hits a wall and comes back! Your only option is to jump! After awhile, the flames will consume Wario’s entire body, allowing you to destroy flame blocks. However, this same form can also be a problem, as you lose control of Wario and it makes it easy to fall to an unwanted place below, so be wary! So if Wario is immortal, and if the enemies sometimes help you, where is the challenge? Well, I mentioned only some enemies transform Wario. However, the spearmen, for example, if they touch Wario with their spears, he will get thrown back a long way, losing permanently 6 coins each hit! We do not want this to happen now, do we? Fire Wario running around. Don’t fall in the water! The game is split up in Chapters, which are split up in Stories, being the stages of the game. At the end of each Chapter, you have to face a boss, in a wide variety of them. You will face a giant snake, a wind maker bird, or even a Basketball playing bunny! Each boss offers a new challenge and force you to know how to use the controls as best as you can. The stages also have very creative ways to conclude them. You might need to reach the end stage door marked with 3 shiny stars, defeat a giant spearman, break a block to make the water flow, among others! The level design of each stage is unique and gives you a new challenge to surpass as you advance through them. Once you clear the final chapter, you get access to a map of each stage, and that is when you notice there is a lot of places you still have to go back to! Certain stages have alternate exits for you to find, allowing you to diverge the path of Wario’s adventure! I will give you a hint: let Wario sleep for a bit longer and see what happens! Not only is this title like Wario Land 4, but it is longer with more hours of gameplay to go through. Wario wakes up in his room, at the begining of the game. With all of this, I almost forgot to talk about the visuals this game offers! There are many varied places to visit, and each chapter is unique, never repeating the scenario. You start off in a castle set to move to a forest and even find yourself in haunted house or a futuristic factory! Colorful and clean, this art-style has many really delicate details that make this a spectacular game to look at. Even for its limitations for being an old game on an old handheld, it still stands strong today. My only remark is that Wario has yellow eyes, which may seem like he had a moment of medication. Besides that detail, everything makes sense and all you see is well represented. Last but not least, there’s also the sounds and music, which are really good 8 bit songs you will remember. All song revolve around a common theme and most share a similar melody, but they are never repetitive. They all fit the mood perfectly! Furthermore, there this satisfying sound of Wario’s actions against his enemies, as he pummels through them either charging into them or crushing them with his fat behind. All and all, the art direction of this title is on point. Another memorable game! In the end, this is the kind of game you need time and patience to go through, take all the time you need to explore every corner and find secrets. If you played Wario Land 4 and Shantae, you will definitely enjoy playing this one! Would I recommend it? Yes, it is a solid game which will give you days of entertainment! Will I play it again? No question about that, I will come back to play some more! If I had to rate it, what would it be? I would give it a 9 out of 10, a very solid title! Do not think twice, if you like exploration, collecting treasures and finding secrets, go and play this one! Entertaining for a long time! If you don't fancy this type of game, it might not be interesting for you. A solid game which will give you days of entertainment! Well, I already read this on Wario Forums, but it’s a nice review none the less. Good job reviewing the game!